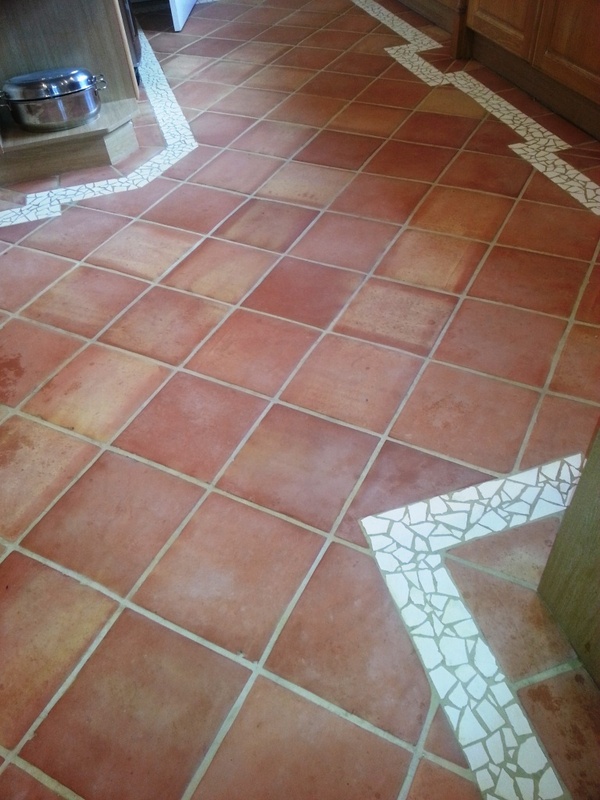 This Terracotta tiled floor was laid in the kitchen of a property located in Horncastle, Lincolnshire. 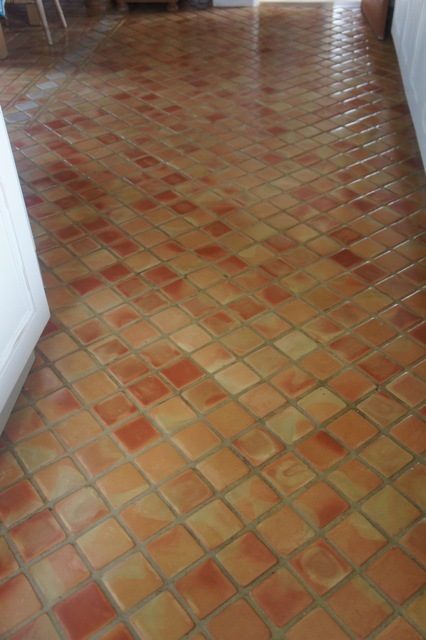 The tiles were well maintained and in reasonable condition compared to some floors I have worked on but they had started to look tired and dull in some areas and so the customer wanted them deep cleaned and resealed. 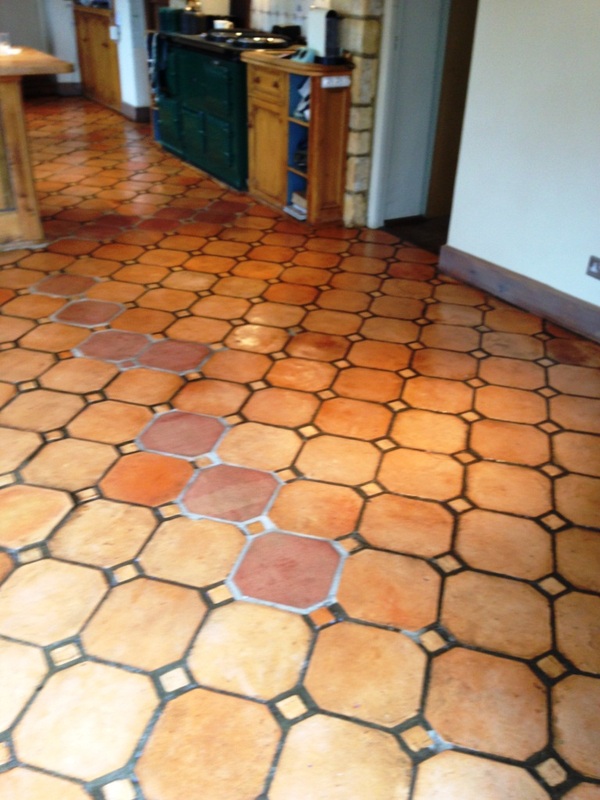 I began the job using a strong solution of Tile Doctor Pro-Clean, which is a heavy duty alkaline product ideal for cleaning natural products such as Terracotta and stripping off old sealers, this was scrubbed in with a black pad fitted to a rotary machine. We repeated the process a couple of times and also used a stiff hand brushes along the grout lines where the pads can often struggle to reach. Once happy the floor was clean it was given a thorough rinse to remove any remaining chemical and left it to dry. We left the floor to dry and then returned then next day to re-seal it. Tile Doctor Seal and Go was used to seal the floor, it’s a topical water based sealer that doesn’t give off an odour when it’s drying and also offers durable stain protection together with a low sheen finish which I think you will agree has added a nice shine to the floor. 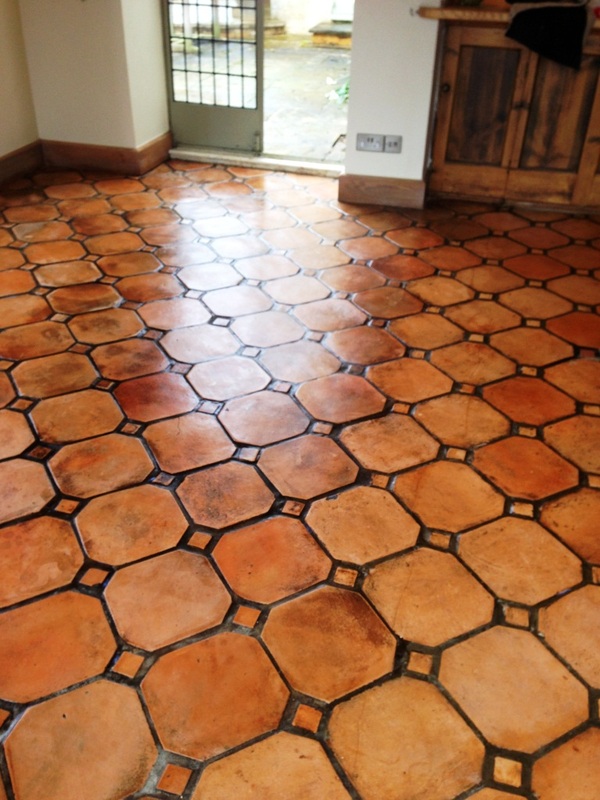 Terracotta is very porous and this floor actually took five coats of sealer before it was fully sealed. Applying a sealer does take a long time to apply as you have to wait for it to dry before applying the next coat. The work took two days in all, you can see the difference for yourself. 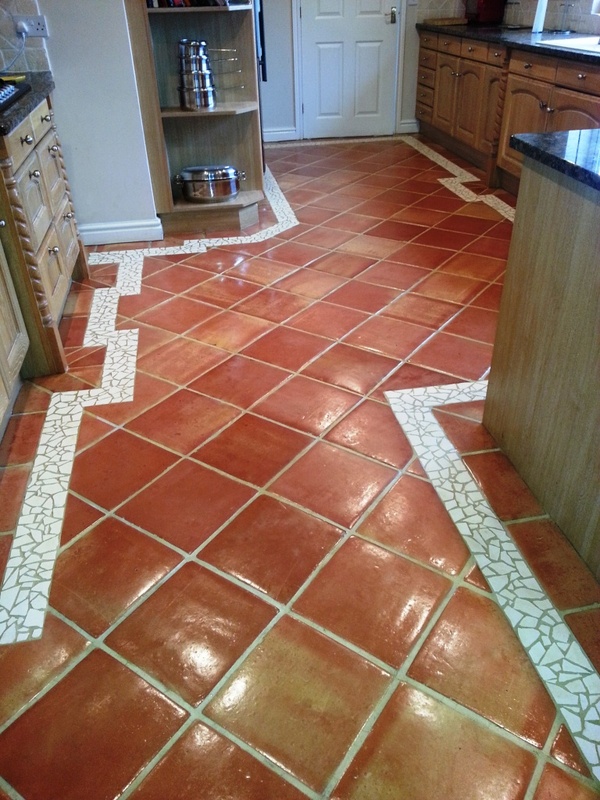 This Terracotta tiled floor was laid in the kitchen of a property located in Shepperton, Middlesex. It had been laid eight years prior and had an initial sealer applied. Over the years the customer had applied polish to help maintain a shine however the sealer and polish were now in a bad state and holding onto dirt. 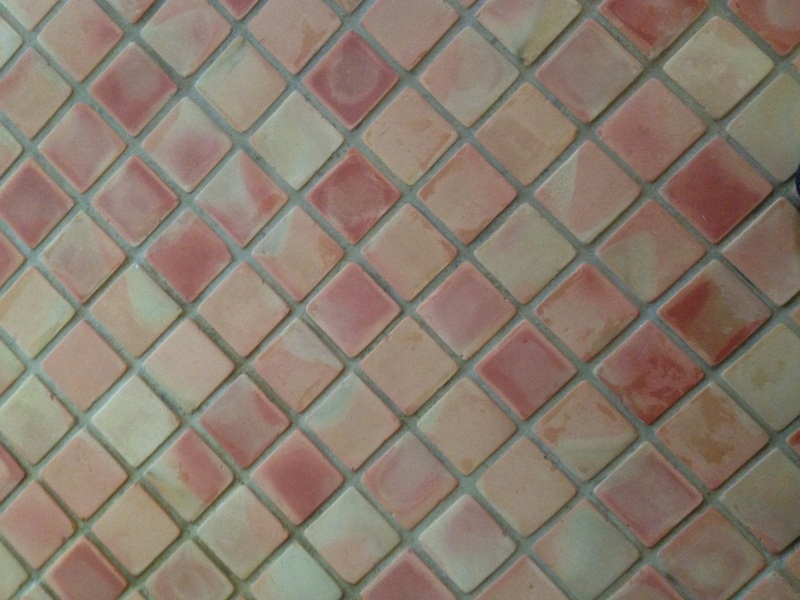 You can see this in the photographs below which show the tiles looking quite dull and the grout grey. I started the job using a strong solution of Tile Doctor Pro-Clean, which is a heavy duty alkaline product ideal for cleaning natural products such as Terracotta and stripping off old sealers and polish, this was scrubbed in with a black pad fitted to a rotary machine. We repeated the process a couple of times and also used a stiff hand brushes along the grout lines where the pads can often struggle to reach. Once happy the floor was clean it was given a thorough rinse to remove any remaining chemical and left it to dry. We left the floor to dry for 48 hours and then returned to re-seal it. Tile Doctor Seal and Go was used to seal the floor, it’s a topical water based sealer that doesn’t give off an odour when it’s drying and also offers durable stain protection together with a low sheen finish which really enhances the natural colour of the tile. 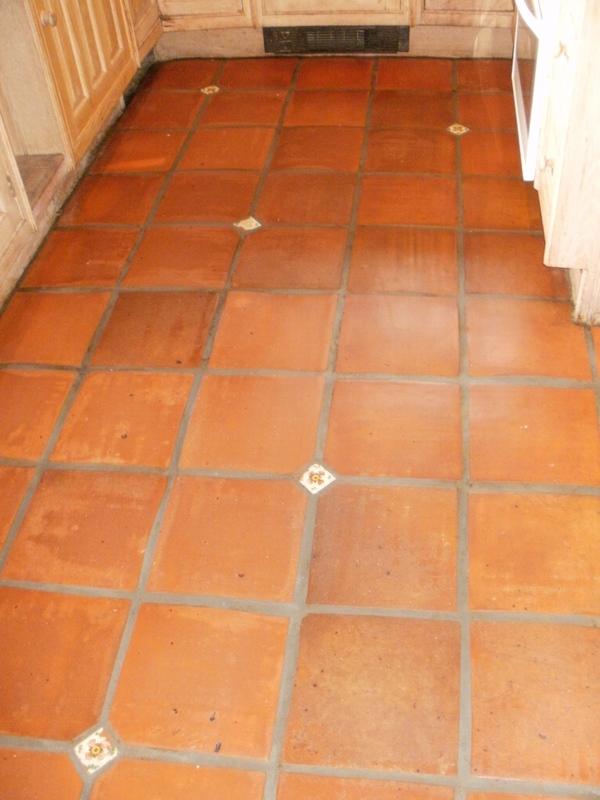 Terracotta is very porous and in the end the floor actually took six coats of sealer before it was fully sealed. Applying a sealer does take a long time to apply as you have to wait for it to dry before applying the next coat. The work took two days in all and you can see the difference for yourself, the floor now looks much improved certainly the customer was very pleased with the end result and now has a floor that is easy to maintain for the future. I cover Shepperton and the surrounding areas so please feel free to contact me. 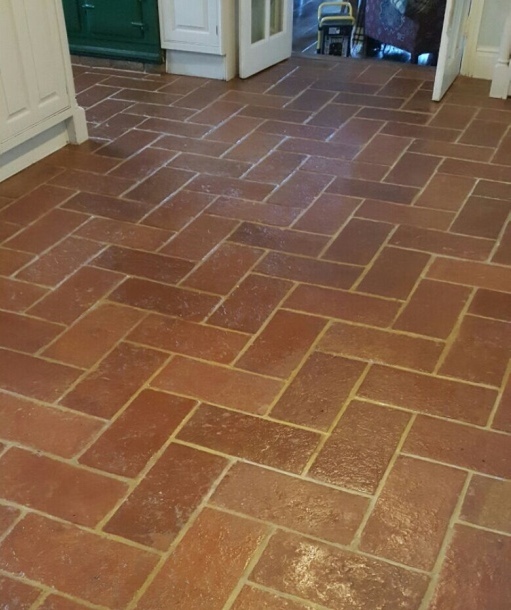 This small Terracotta tiled floor with tumbled travertine inserts at a house in Middlemarsh, Dorset was around 25M² and had been in place for over ten years, since before the owner moved in. After a recent freezer leak caused the tiles and grout to become stained in the utility area; the customer was looking to either clean them or replace them as she wasn’t that keen on them anyway. After a demonstration of what could be achieved she was happy to go ahead and have them stripped and resealed as opposed to the more expensive replacement option. 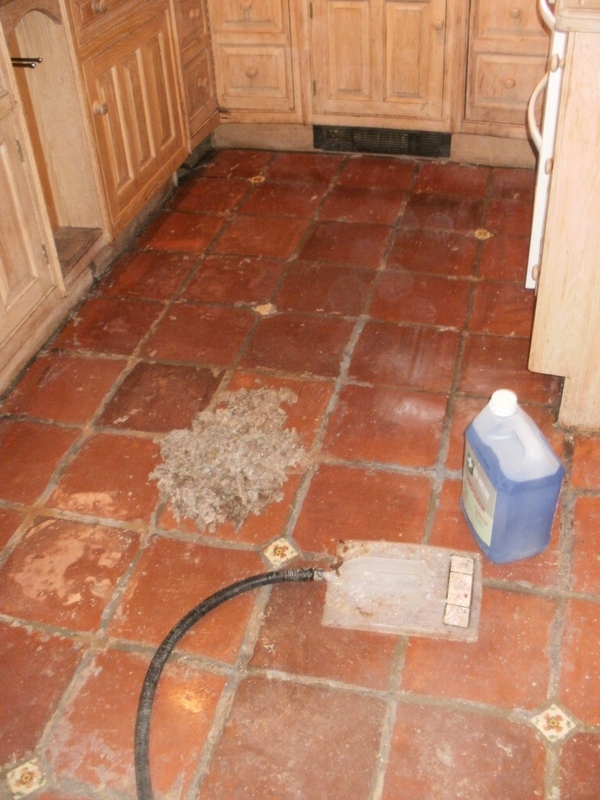 The floor was covered in a strong dilution of Tile Doctor Pro-Clean and this was left to dwell on the floor to allow it to soak into the tile and get to work on the dirt and breakdown any remaining sealer. The solution was then worked into the tile and grout using a heavy 17″ rotary scrubbing machine and then rinsed down using a high pressure wash to remove the soiled solution and neutralise the floor of any remaining cleaning solution before sealing. The grout proved to be stubborn to clean so we had to repeat the process a second time and use stiff hand brushes along the grout lines to get them clean. You should be able to appreciate from the photographs below how we have managed to get the floor back to its original state and the difference in the grout particularly which was looking very dark prior to cleaning. 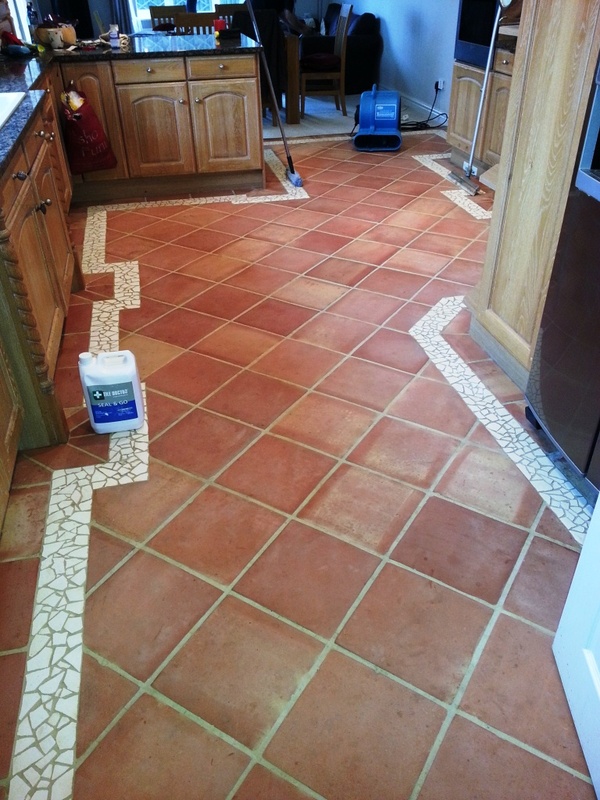 The customer had opted to seal the floor themselves with Tile Doctor Seal and Go naturally I was keen to see how it came out so I asked them to send me some photographs a couple of which are shown below. The final result is a practically new floor and the customer is very happy with it. 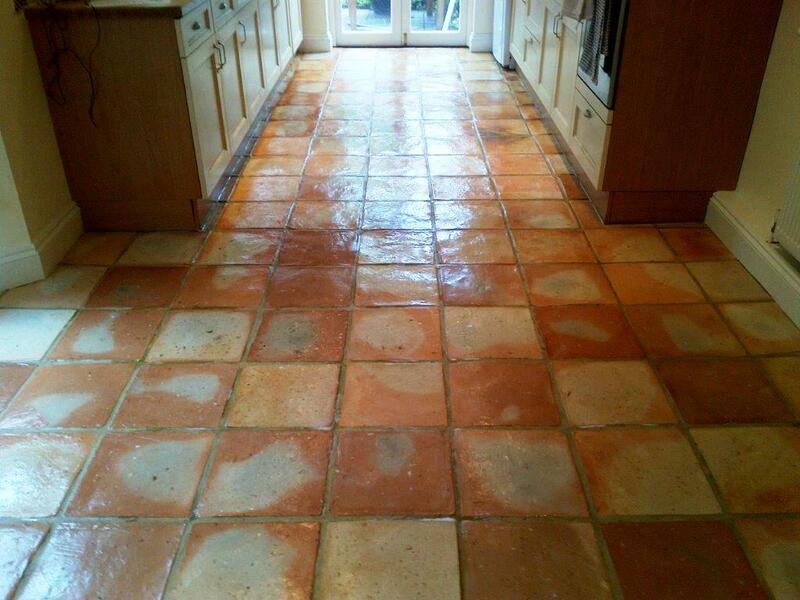 This customers Terracotta tiled floor was installed in the kitchen of a house in Great Missenden and had become ingrained with dirt and soiling over the last twenty years leaving an unsightly black greasy appearance which was impacting the sale of the property. On the first day we covered the floor with a strong dilution of Tile Doctor Pro Clean which is a heavy duty Tile Stone and Grout Cleaner mixed 50/50 with Tile Doctor Ultra Clean which adds abrasive particles into the mix. 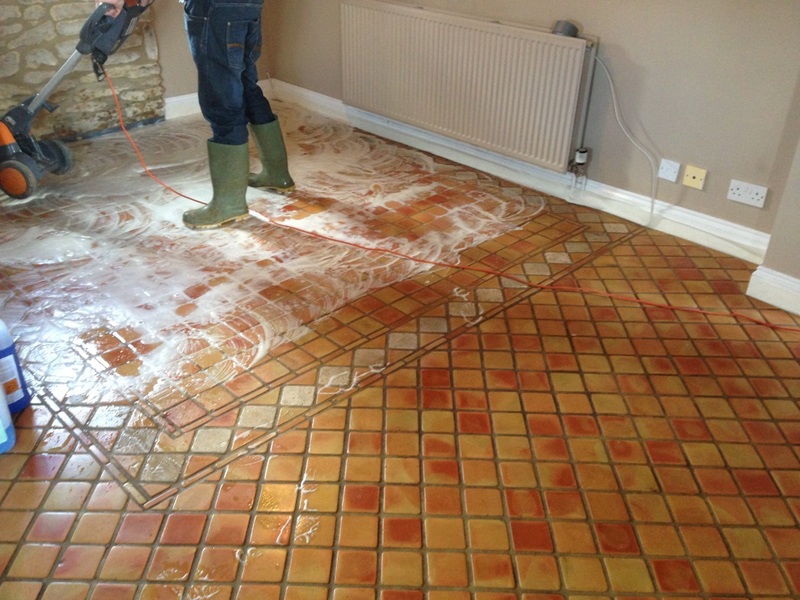 The resulting combination provides a powerful cleaning agent that penetrated deep into the tile and in conjunction with a rotary machine fitted with a scrubbing pad managed to remove several layers of soiling. We then rinsed the floor with fresh water and removed the vast amount of slurry with a wet vacuum. The next step of our cleaning process was to apply Tile Doctor Remove and Go across the tiles and let it soak in as before; Remove and Go is a coatings remover that will strip the floor of any seal or wax coatings which had been applied to the floor over the years, again the product was worked in using a scrubbing pad and then washed off. Once we were happy with all cleaning and seal and wax removal and the floor had returned to its original condition we left the floor to dry. Once the floor was dry we started to seal it in order to protect it and for this we chose Seal and Go which not only leaves a surface protection but also brings though the true colour of the stone returning the floor to its original beauty, Terracotta is very porous and it took seven coats before it was fully sealed. Our customer was very happy with the difference and I have since been informed they have received a first offer on the property. 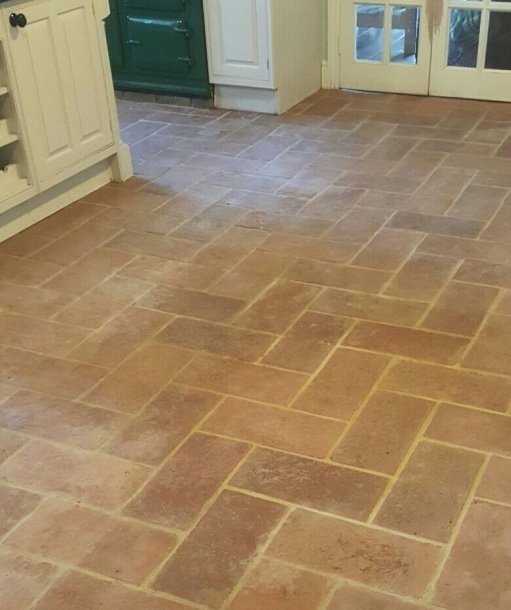 We had our work cut out for us restoring this Terracotta floor installed in the kitchen of a house in Clapham, south west London. Over the years it had been covered with many layers of metallised emulsion polish, this had been put on without a primer and Terracotta being porous it had soaked into the tile. Various efforts to remove it in the past had not been successful and had resulted in some damage to the floor. This had been covered by yet more layers of metallised emulsion which had yellowed and oxidised over time. 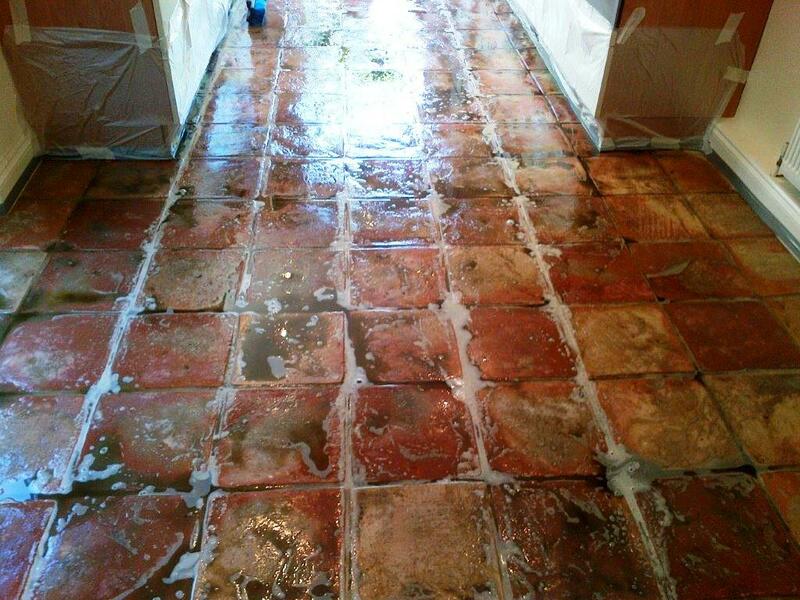 Working in stages, I laid down Tile Doctor Remove and Go, which is a powerful coating remover, to break down the layers of metallised emulsion and then steamed the tiles and scraped and wire-brushed the remnants of it away. 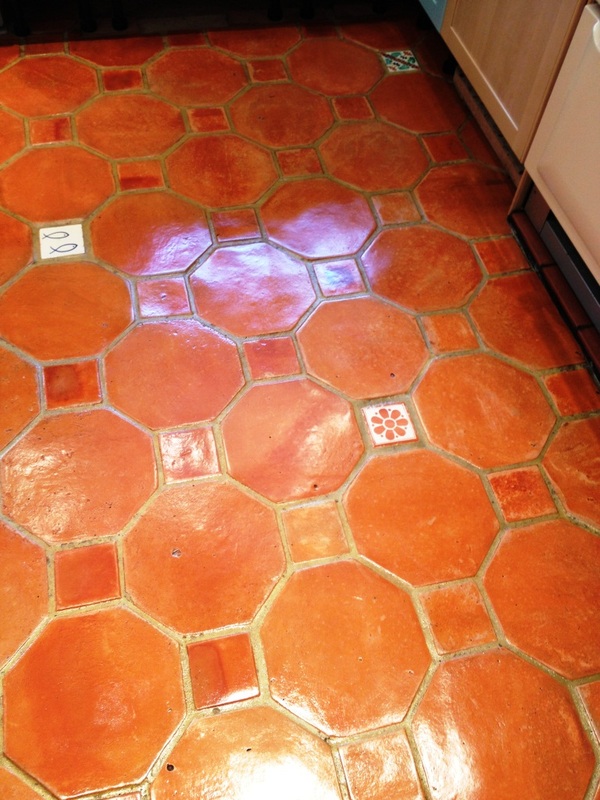 Once this was done more Remove and Go was applied to the terracotta tile to remove the polish that had sunk deep into the tile when it was first applied more than twenty years before. Again a steamer was required to help bring out what was left of the original misused sealer! Once I was happy this was followed by a thorough clean with a dilution of Tile Doctor Pro-Clean scrubbed in with a black buffing pad fitted to a Numatic floor buffing machine. Last step was to give the floor a thorough rinse with water in order to remove any remaining chemical and neutralise the Terracotta. After two days work cleaning the floor I left it to dry out overnight and returned to seal on the third day using six coats of Tile Doctor Seal and Go which will protect the floor and also gives the surface an attractive low sheen. You can see the transformation in the floor and the customers were very impressed and preferred the lightened natural look compared to its previous appearance. 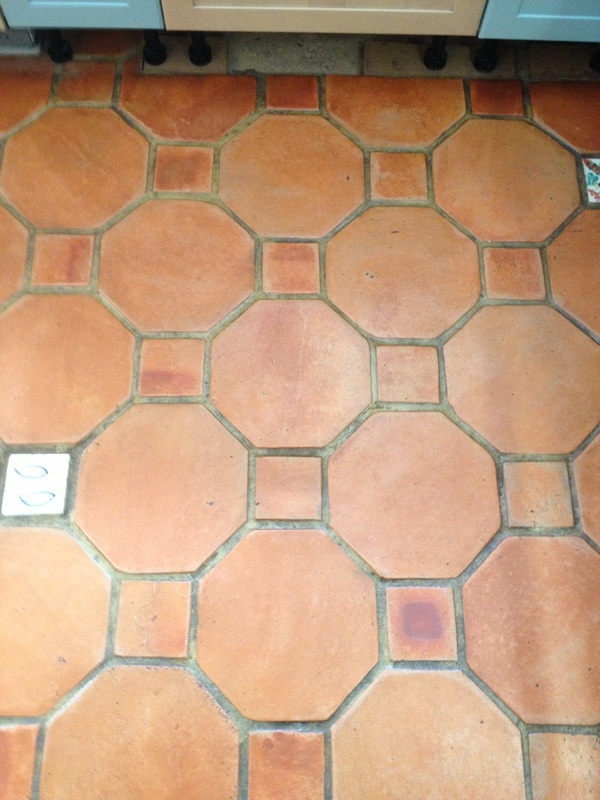 This terracotta floor was in a 1950’s style property in the village of Cringleford near Norwich. In total there was 13m2 of tile laid in the kitchen and conservatory around fifteen years ago. 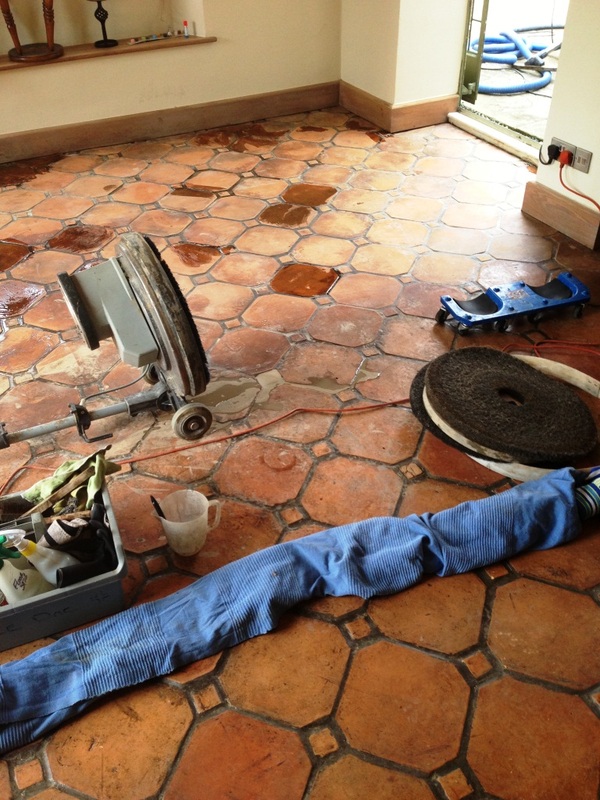 The floor had been given very little treatment since then resulting in the tiles looking faded and dull. 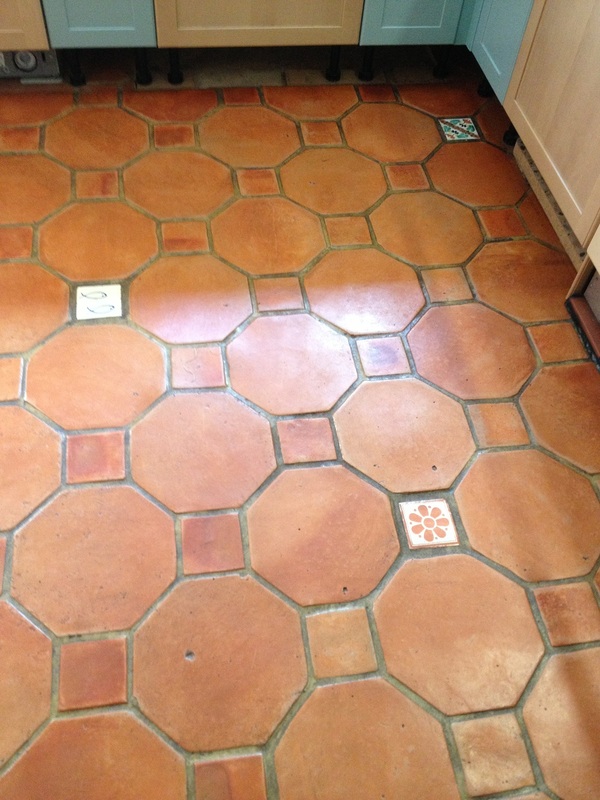 I started the job using a solution of Tile Doctor Pro-Clean, which is a heavy duty alkaline product ideal for cleaning natural products such as Terracotta, this was scrubbed in with a black pad fitted to a rotary machine. We used 3 litres of Pro-Clean in total having had to repeat the cleaning a couple of times, we also used stiff hand brushes along the grout lines where the pads can often struggle to reach. Once happy the floor was clean it was given a thorough rinse to remove any remaining chemical and left it to dry overnight. 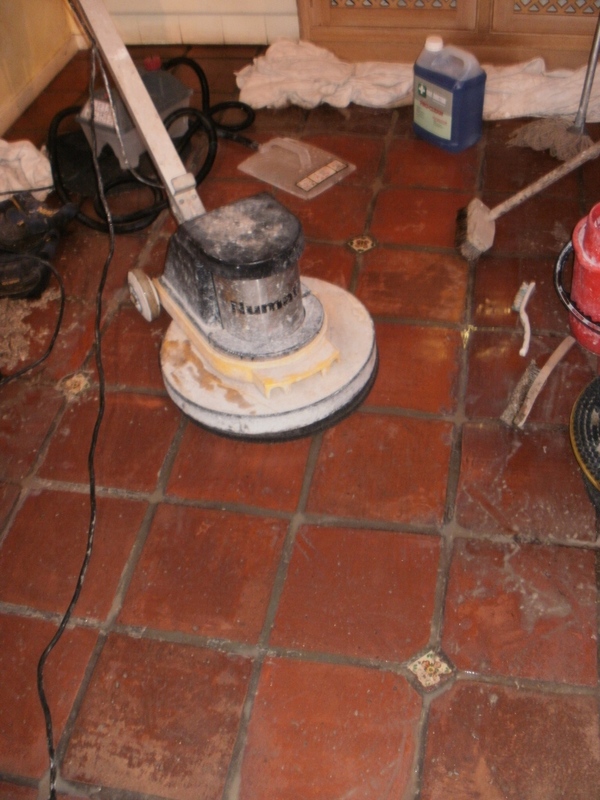 A dehumidifier was left running to ensure that the floor was dry enough to seal the next day. The next day came back to do the sealing and checked the floor first for any spots we might had missed and also to ensure it had dried sufficiently. Tile Doctor Seal and Go was used to seal the floor, it’s a water based sealer so it doesn’t give off an odour when it’s drying and also offers durable stain protection together with a low sheen finish. Terracotta is very porous and in the end the floor actually took seven coats of sealer requiring three litres of Seal and Go before it was fully sealed. Applying a sealer does takes a long time to apply as you have to wait for it to dry before applying the next coat. The work took two days in all and you can see the difference for yourself, the floor now looks wonderful and will be a lot easier to maintain going forward. 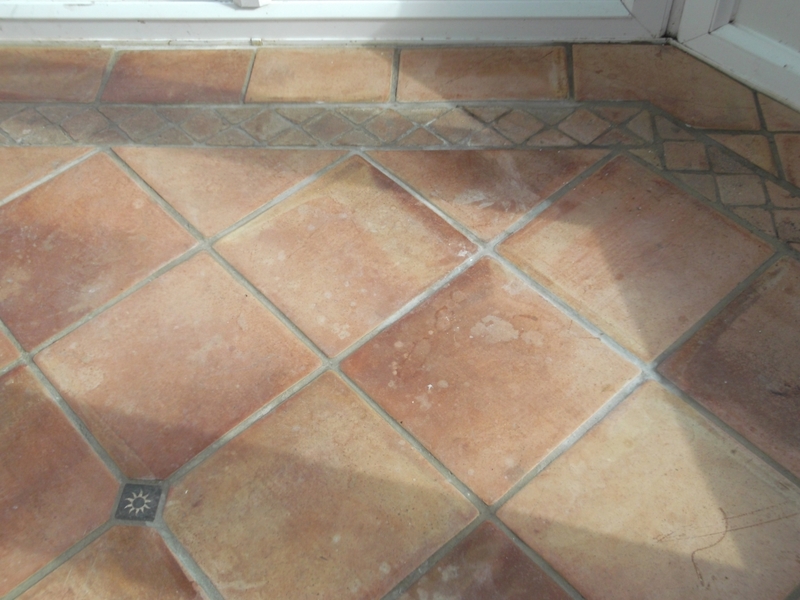 To remove any remaining sealer and deep clean the Terracotta tile we used a strong dilution of Tile Doctor Pro-Clean worked into the floor with a buffing machine fitted with a black scrubbing pad. Pro-Clean is an ideal cleaner for natural floors due to its alkaline formula which doesn’t eat away at the tile like an acidic cleaner, it’s also very good for cleaning up grout however I find that’s best tackled manually using a stiff brush. Last step in the process was to remove the soiled cleaning solution with a wet vacuum and then wash the whole floor down with clean water in order to neutralise it before sealing, we then left the floor so it could dry overnight. The next step was to seal the Terracotta floor and for this we applied Tile Doctor Seal and Go which is a water based sealer recommended for Terracotta floors, it provides stain protection and a low sheen that lifts the look of the floor. 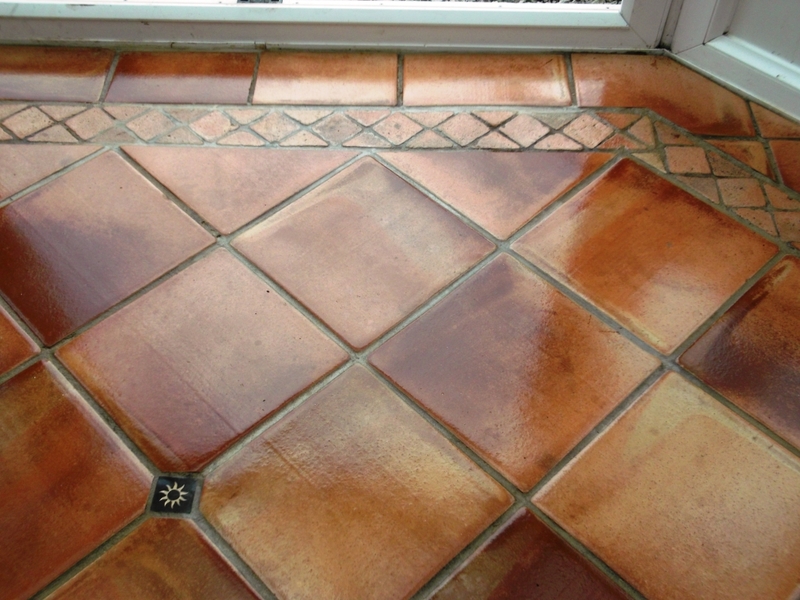 Seven coats were required due to the porosity of the Terracotta tile. 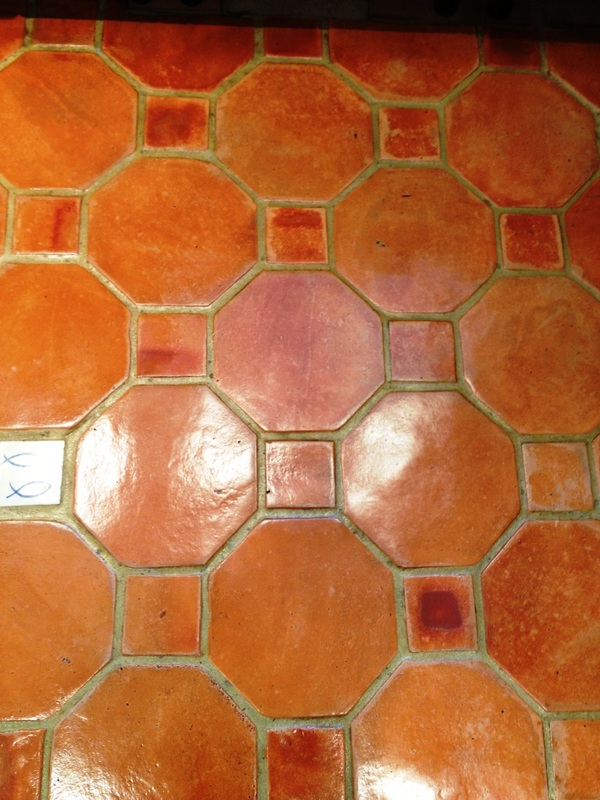 Although officially the East Surrey Tile Doctor we often get requests further afield through customer recommendations, this particular Terracotta Tiled floor was in Brixton, South London. You can see from the video below that the floor was not looking its best and had been splashed with paint. 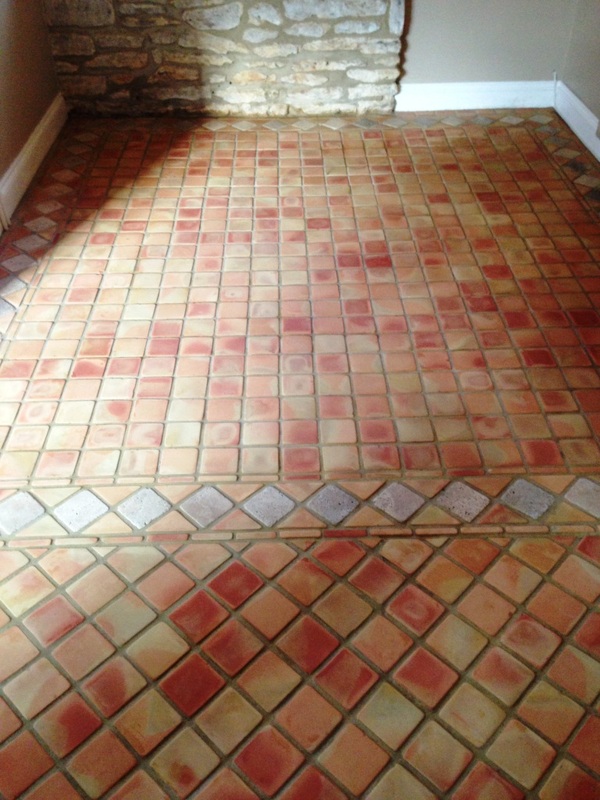 This job was a Terracotta Tiled kitchen floor in Paxford near Chipping Camden, the Terracotta tiles were in a large kitchen/diner which had a mix of different types of Terracotta due to the replacement of some damaged tiles. The recently fitted tiles were slightly darker than the older tiles in the kitchen area and the customer wanted a closer match but at the same time didn’t want the floor looking new (with all the wax and oil removed) just the old tiles made darker. You can clearly see the problem in the first photograph below. The floor had a heavy build of a wax and oil coatings which we tackled with a Tile Doctor Pro-Clean mixed with two parts NanoTech Ultra-Clean; this combines the strong cleaning power of the alkaline Pro-Clean with the nano sized abrasive particles in the Ultra-Clean to make a powerful cleaning agent. We left the solution to dwell and soak into the tiles for twenty minutes before working it in with a heavy floor buffing machine fitted with a black scrubbing pad, some areas had experienced little foot traffic and so had a thicker coating needed up to three cleans. All the edges were done by hand using wire wool pads and brushes. The soiled water was picked up by a wet and dry vacuum and then the floor was thoroughly rinsed with water using a high pressure spinning tool. 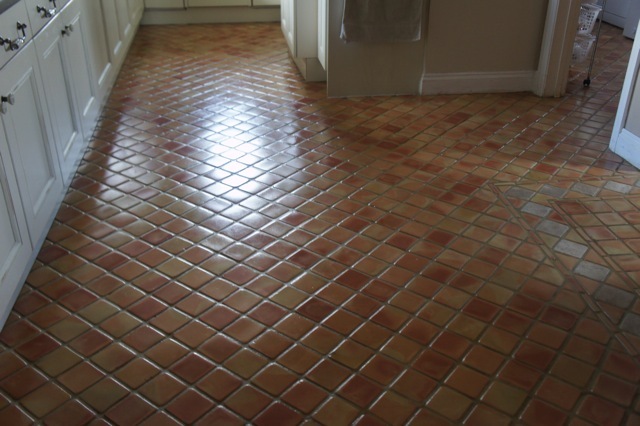 We let the floor dry overnight and returned the next day to seal it for which we used a combination of Tile Doctor sealers. 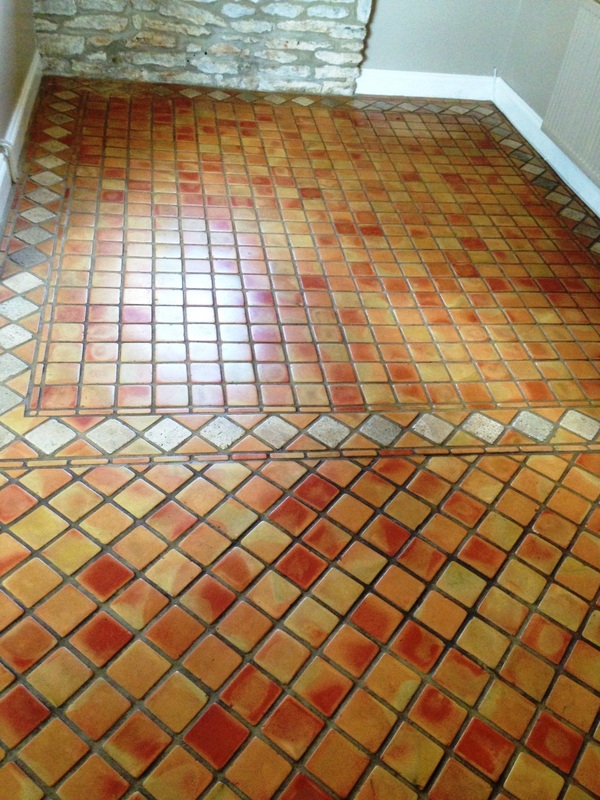 The first step was to darken some of the lighter tiles so they would match the others in the dining room we did this using a sealer called Colour Grow which brings out the colour in a Tile. Once we were happy with this floor was fully sealed using five coats of Tile Doctors new formula High Shine sealer to give a uniform look.